As summer winds down, it’s time to assess how you’re progressing on your plan for the year. With only four months remaining, now is the perfect time to start considering a few side hustles to pick up extra income. I am always on the lookout for new ways to earn money. If you’re creative and willing to work, eventually you may be able to replace a corporate salary with side hustles. Not only does this create the financial independence you’re seeking, but by diversifying your income, you’ll reduce your financial risk. But while earning extra income is great and is probably why you’re here in the first place, the key to successful side hustles is not focusing on the income. Even though that sounds counter-intuitive, it’s important to focus on the benefit you’re providing to your client. When you’re starting out, the income may not seem significant especially if you still have a day job. But if you create a service that meets your client’s needs, the income will take care of itself. In addition to the extra income and diversification benefits, there are other reasons to start side hustles. Most importantly, creating a side business helps develop your entrepreneurial skills. Learning to sell yourself and your products or services will benefit you beyond just this business, but will carry into other areas of your life. Building a loyal customer base takes time, energy, and a good plan. But once you have achieved this goal, you will have laid the foundation for a successful business. Having supportive fans who value and trust your opinion and are willing to buy from you is the key to any business. As difficult as it is to earn this trust, make sure you do everything you can to keep it. Provide a valuable service at a fair and reasonable price. Be responsive. Continue to cultivate a relationship with your clients. If you follow good practices, your side hustles can help you achieve the financial independence you seek. 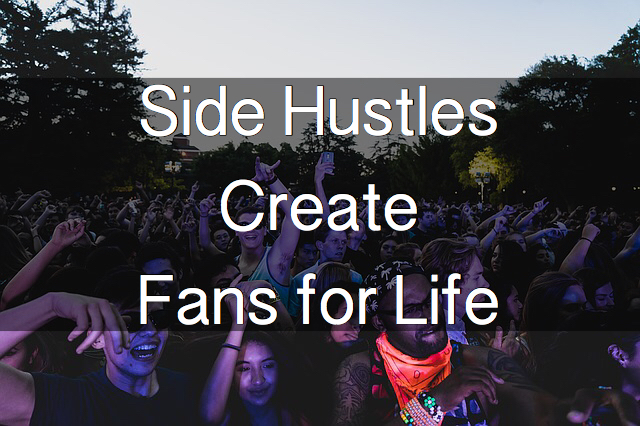 Read below to get started thinking about what side hustles will work for you. I have either provided or purchased each of the services below and in all of these side hustles, you can easily earn $25 to $50 per hour without investing much time or expense. Online teaching – A few years ago, I taught an online college course on mergers and acquisitions. In most cases, you will need at least a college degree if not an advanced degree depending on the level you are teaching. It was a great way to make extra income. There was quite a bit of similarity to running a blog as all the interaction was through chat rooms. And once I had taught a few classes, the process was almost automatic. Academic tutoring – If you are the teaching type but can’t find a position teaching online, academic tutoring may be a good option instead. Focus on a specific area such as math, SAT preparation, or language. Music lessons – I keep recommending this to everyone I know who plays an instrument. Not only does this provide extra income, it allows you to do something you enjoy. Private sports lessons – As youth sports have become more competitive over the years, parents are increasingly looking for paths to elevate their children’s athletic performance. House sitting – If you have the flexibility, house sitting can be an easy way to generate money. And additionally, you can almost treat the experience as a mini vacation while you stay in someone else’s house. Pet sitting – Sometimes done in combination with house sitting, pet sitting can be an easy way to make a little extra money on the side without spending anything. Tax preparation – If you are good with numbers, becoming a tax preparer is a good way to utilize that skill in a side hustle. You can either go to work for a third-party company or work for yourself. This business will take a little more effort to learn and to find clients as you need to develop trust with someone before they’ll let you work on their taxes. Bookkeeping – Continuing along the numbers theme, you can set up a bookkeeping business both to make money but also to feed a tax preparation business. You need to keep your fees reasonable, as you’ll be competing with CPAs, but there is always a market for bookkeeping services. Online business – Lastly, now is the perfect time to start an online business. This is my favorite of all side hustles as it requires very little money, experience, or knowledge. It will require upfront work, but the upside is much greater than most anything else you can start. If you decide to start an online business, consider using a WordPress site hosted by 1and1.com. It is really a simple process and if you sign up using my affiliate link below, I earn a small commission. And because I am familiar with the company, I can lend my assistance in the process. Once you have settled on one of your side hustles, you’ll need to begin marketing yourself. You need to get the word out that you’re in business. This can be either through a website, advertising, or just networking. I really think that no matter what business you’re in, you should set up a website. A website gives your business instant credibility. And the time and money required to create a simple website is small compared to the benefit. Your website serves as your home. It’s a consistent way for clients to see your services and get in touch. Advertising may cost a little money, but when you’re just starting out, it can be a quicker way to start bringing in new business. While online advertising is an option, if you’re side hustle is a local service, you may find more success advertising locally. Try connecting with real estate agents, insurance agents, or others with strong ties to the local community. Those individuals often have newsletters they mail out in which you can buy advertising. Lastly. networking is the least expensive, but most time-intensive form of promotion. Once you’ve started getting clients, use those clients as references and sources for new business. If your service is valuable, you shouldn’t have any trouble getting your existing clients to refer you to their friends. Just make sure you follow up on any referral and thank your existing client whether or not the referral actually leads to new business. The fall is a great time to launch a new side hustle. With the kids back in school, you may find you have a little extra time. Why not put that time to good use and start generating extra income. Readers, I’m always looking for new side hustles. If you have any other suggestions, please let us know. I’ve only recently realized the true value of side hustles. A passive income of $5 that someone gets on Fiverr may not be a lot of money but that’s $5 that you’ve never had before. A couple hundred dollars here and there does monumental wonders and it’s so essential these days with the lack of job security.